Surge Tank: Why Surge Tank is Required in HydroElectric Power Plant? Surge Tank is an essential part of a Hydro-Electric Power Plant. 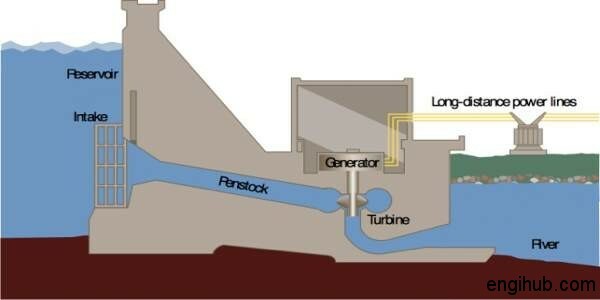 In Hydro Electric Power Plant Water is used to generate Power by using some Hydraulic Machines. For the smooth operation of Power Plant, some necessary engineering arrangements are required. Hence Surge Tank is one of them. The requirement of Surge Tank is due to some problems which occurred in Water Flow. So, here I will like to share information on why surge tank is necessary for hydro-electric power plant with you. Due to Motion, Water possesses some Momentum. This Momentum is destroyed, if the Flowing water is suddenly brought to rest, by closing the Valve. A very High Pressure is developed on Valve. This High Pressure is followed by a series of Pressure Vibrations, resulting in noise in the pipe. This noise is known as “Knocking”. The sudden rise in Pressure has the effect of Hammering Action on the walls of the pipe, known as Water Hammer. This Water Hammer can burst the pipe. In Hydro Electric Power Plant, the requirement of Water goes on changing, hence it is essential to increase or decrease the Discharge flowing through the pipeline. Whenever the requirement of Water suddenly decreased, the Valve must suddenly close. Hence this resulting in a very High Pressure developed in an entire pipeline between the Reservoir and the Turbine. This is happened due to Water Hammer. To overcome this problem, a Storage Reservoir called as “Pen Stock” is fitted at some opening made on the pipeline in order to store Water when the Valve is suddenly closed, or to discharge Water when increased discharged is required. Such a Storage Reservoir is known as “Surge Tank”. 01) To control the Pressure Variations, due to rapid changes in the pipeline flow, thus eliminating Water Hammer possibilities. 02) To regulate the flow of Water to the Turbine by providing necessary retarding Head of Water. The Surge Tanks are placed near to the Turbine. The Height is generally kept above the Maximum Water Level in the supply Level Reservoir.